Azi Amirsadri is a full-time therapist at the Gil Institute. 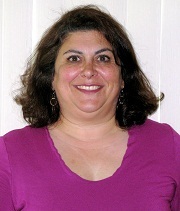 She is a Licensed Marriage and Family Therapist (LMFT) in Virginia and a Registered Play Therapist (RPT). Azi graduated from Rutgers University with a degree in French. She then received her Master's degree in Counseling at George Mason University, in Fairfax VA and her Post-Master's in Marriage and Family Therapy at Virginia Tech University’s Northern VA campus. Azi has worked in various clinical settings and has extensive experience working with at-risk adolescents. She is trained to conduct the Extended Play-Based Developmental Assessment (EPBDA, Gil) and received specialized training to offer Boundary Project services for problem sexual behaviors in young and school-aged children. She has completed an intensive training in Family Play Therapy and Theraplay Level I. She is trained in expressive therapies, play therapy, and Trauma-Focused Cognitive Behavioral Therapy. Azi has also years of experience providing individual, marital and family therapy. She is fluent in French and Farsi.